We’ve got a new secret weapon to help you get glowing, healthy skin, and her name is Stacie. 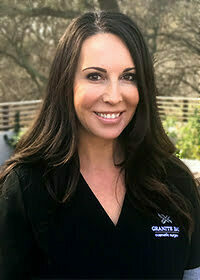 A bona fide skin care expert and Aesthetician Extraordinaire, Stacie has over 20 years of experience working in the medical and aesthetic dermatology setting. Now, she’s at GBC! Stacie provides a full range of peels, facials, and more at our GBC medical spa, along with comprehensive skin care plans to meet your goals, budget and lifestyle. Stacie’s seen all sorts of beauty trends come and go, and she really knows her stuff when it comes to skincare. She’s helped several of our GBC team overhaul our own skin care strategies, and we totally trust her expertise and advice about which treatments and products are really worth it to help us get smooth, youthful skin. A life-long Sacramentan, mother of two, and one of the smartest, friendliest women we know, Stacie’s a mom who’s got it going on. But you don’t have to take our word for it—for a limited time, she’s inviting our patients to pick her brain for free! Book your skincare consultation with Stacie before February 28th, and you’ll not only get your consult on the house, but we’ll also through in a gift from ZO Medical when you purchase $200 or more in skincare products or treatments. Past GBC MedSpa regulars, check your email—we’ve sent an exclusive offer your way. Don’t miss your opportunity to get free skin care advice from one of Sacramento’s most sought after aesthetic experts.